Here, we're taking the Arturia MicroBrute and combining it with two Koma units in order to expand its sonic range. The synth's audio output is left unaffected, and its patchbay is used to increase the number of modulation sources. Remember there is no single standard for the voltage ranges any device might employ. However, it is worth being aware of two aspects of the lingo: unipolar and bipolar signals. A bipolar signal moves between maximum and minimum values, neither of which is zero (commonly positive and negative voltages). A classic example is your household AC mains supply. In the CV world, a good example of a unipolar signal might be that used for DIN Sync. This employs the TTL (Transistor-transistor logic) standard of pulses and triggers that move between 0V and 5V (and nothing in between). In reality, this sits on the cusp between digital and analogue systems, but it's still all about voltage. Step 1: The MicroBrute is joined by two boxes that host a good complement of jack sockets. The MicroBrute provides oscillators, an LFO, envelope and filter; the additional units will be used for an additional LFO, envelope and step sequencer. Step 2: The LFO section of the Koma RH301 is more complex than that of the MicroBrute, with more waveshapes and adjustable symmetry. The rate can be free-running or locked to incoming MIDI, DIN or analogue clock. Here, it's patched to the Arturia's filter cutoff. Step 3: The RH301 includes a proximity sensor, generating a voltage output that increases the nearer your hand (or foot!) gets to it. This makes for a highly interactive and quick-responding control. Here it is patched to the synth's pitch to create a simple Theremin-style setup. Step 4: Increased flexibility comes from having an additional inverted LFO output - its polarity is the opposite of the main LFO. Here, the LFO is patched to PWM, while the inverted version is patched to Ultrasaw depth (progressively adds two phase-shifted sawtooth waves to the original). Step 5: Here, the Koma's LFO is used to modulate the synth's pitch, but with the LFO speed controlled by the external envelope. 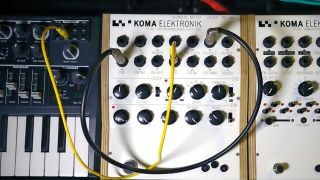 The Koma's envelope is set to free-running loop mode rather than being triggered by its Env Gate input. Step 6: Finally, we use the Koma FT201 filter sequencer as a simple CV-generating step sequencer. It receives external clock timing from the RH301 and the output voltage of each sequencer step (set using the small pots) is sent to the MicroBrute's pitch input.